Body Transformation: Jordan Abissidan Lifted His Way To Single-Digit Body Fat! Jordan focused on bodybuilding to cut body fat and feel good about his physique. Get the formula that helped this teen achieve single-digit body fat in one year! I decided to start training on October 25, 2012, with two of my best friends because I wanted to change my life. Throughout high school, I was pretty chubby. Everyone wants to look fit, so I decided to do everything possible to accomplish my goals. I was tired of living unhealthy. I knew I was overweight and decided to hit the gym. No one feels good in their skin knowing they're overweight. Going to the gym makes me feel amazing. I'm in my own bubble while training. I was disappointed after not seeing results in the first four months, so I began reading more and researching about diets and programs that could help me. Three months after starting my research, I was down 30 pounds which made me proud and love the gym more. The only way to achieve your goals is through hard work and dedication. In the first few months of my training, I did lots of research about the gym, programs, supplements, and diets. I don't have a workout partner, but I would like to thank my personal trainer and cousin who's a personal trainer. They always answered my questions. Dieting and training are complimentary. Most people say it's 70 percent diet and 30 percent training, but I see it as 100 percent diet and 100 percent training. Consistency is my secret. 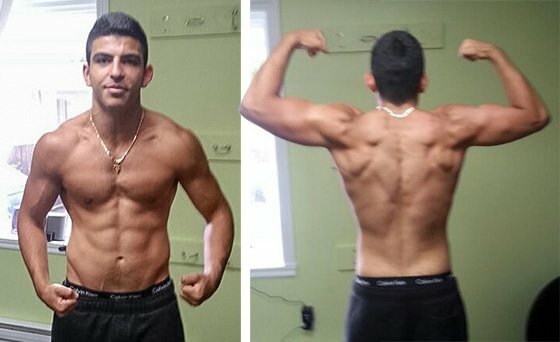 I received inspiration from my cousin who's currently a men's physique champion in Quebec. Arnold Schwarzenegger, Phil Heath, Jay Cutler, and all bodybuilders motivate me. Achieving a goal is the best feeling ever. Goals are what keep us working. To get big, you must lift big. I hardly use machines in the gym and focus on exercises that require free weights. The most challenging part was the diet. After a few months of seeing no results, I realized that I needed to follow a diet. I researched nutrition to see good results in the long run. Without a solid diet you will have a hard time achieving your goals. "Do research to increase your knowledge and performance in the gym." I'm proud to say that I'll be competing on March 22, 2014, in a men's physique competition. I inspired many of my friends to start training. I'm also starting classes to get my personal training certification. I want people to tell me that I'm a reason they get fit. People will always try to bring you down, but you can't listen to them. Lifting with good form should be your number one priority. Do research to increase your knowledge and performance in the gym. Leave your energy in the gym. Bodybuilding.com helped immensely. When I first started training, I spent hours reading programs and diets on Bodybuilding.com. The transformation articles are proof that anyone can change with hard work and dedication. Bodybuilding.com also has an amazing store. "Go Hard Or Go Home" by Roy Jones Jr.